I am a big advocate for young adult literature and when I found out about an opportunity to read and review a YA book, I couldn't wait! Some people may find it silly, but even though I am approaching the end years of my twenties, I still enjoy a good book geared for teens. 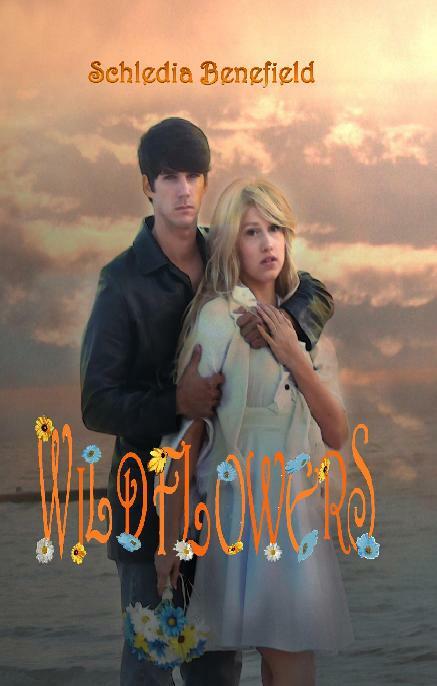 This week only, Wildflowers is on sale for 99 cents! You can grab your discounted copy now through the 31st. At the very beginning of the book, we are introduced to Aster, a teenage boy who has had a terrible home life. The way his story is set up leaves little hope for his own happy ending. Seriously - he has the kind of childhood that ends up on a Law and Order SVU episode. He befriends a fellow classmate, Susan, and it is clear from early on that the focus of the book will be the relationship between these two characters. One may assume from the title that this is a girlie book, but it isn't. Most of the story is told from the male character's perspective. I love that the reader gets an explanation behind the title early on. It's such a clever one, too! I should note that a little ways into the novel, there is a quite lengthy discussion on Christianity. I can see where this could be a tad off-putting for some readers. I even found myself becoming a bit impatient during this section. Religion is a sensitive topic. Benefield tackles this topic tastefully, though. Once I read through the book completely and found out how the conversations about God between the two main characters plays into the ending, it all fit together. Stand down, everyone. It's ok. A little religion is alright. So if you grew up in a conservative Christian home like I did, the passages about prayer and salvation will feel familiar. If you didn't, don't turn away. There is SO much more in the book aside from the Christian overtones. Instead of simply being a story about a troubled boy and a naive girl trying to turn his life around, the issues run much deeper. Benefield tackles a very sensitive topic in Wildflowers - domestic abuse. Having had a family member of my own go through the pains of abuse, this topic is very close to my heart. I can't even imagine being abused by someone that you love, but I know how it feels to have to watch someone deal with the aftermath. It makes me sick. The end of the novel broke my heart. It's a Nicholas Sparks level of tragic. It makes me angry. It makes me sad. I wanted the story to end a different way. Benefield definitely did an adequate job of getting me as the reader attached to her characters. Even if you're not a young adult any longer, if you're looking for a read that won't break the bank, cash in on this week's deal and grab your copy of Wildflowers. If you do, let me know so that we can talk about it! You can find out more about the author and connect online through twitter, goodreads, and her blog. Leslie, I'm so glad you were able to see past the Christian conversations that take place through the characters' dialogue and understand why it was written that way. It was one of the struggles I had in writing the story because I didn't want people not to finish reading the story because of a Christian character talking about God, but I knew that they were necessary conversations for the characters to have. Honestly, I don't think anyone wants stories to end tragically, BUT because of the issues dealt with, it was the way life often is, but my hope is that readers can see the good that did come from it. Everyone loves a happy ending, but it's not realistic. Things don't magically work out for every character just because it's the end of the book. It's not a sitcom where all conflicts are resolved within half and hour. But even so, my heart wishes that things could have ended differently! I actually plan on it being similar to Wildflowers starting off with where they go from the ending (yep, gotta see how everyone deals with the plate left on their table! :) ), but coming across some information in the process that takes them back in time to fill in the missing years in Wildflowers. I've got this one in my TBR list! I really enjoyed your review. I consider myself a religious person but sometimes I don't want preached at so I appreciate your heads up to keep reading. Really the more I read about this one the more I want to read it! And don't worry about liking YA, I'm knocking on 30's door and I think YA will always be my fav! Thanks, Alli! Let me know when you're done reading it so we can discuss the book! I read all different kinds of books, but for whatever reason I'm still drawn to YA! I hope you like it, Allison. I enjoy getting feedback from readers, so both of you feel free to ask me any questions you may have about it, or if you just want to share with me how certain things made you feel.